Either way, it's good – Chocolate pot de crème or panna cotta? Quoi qu’il en soit, c’est bon – Pot de crème au chocolat ou panna cotta? Again it’s that time of the year…allergy season. Stuffy nose, runny eyes, and non stop sneezing, at least it’s a sign that warms days are ahead…of course a little energy for cooking related activities especially with the anti histamine pills that make me feel like my head is a giant pumpkin and weight 300 lb. So when you are in that type of mood and need to cook for a dinner, you’ll have to somehow find a menu that does not require too much standing, nor being too focus on too many details. Alors voilà, this is the last course of the menu, a very easy dessert for a chocolate tooth. Sometimes it’s difficult to differentiate between two similar dishes, those pots de crème have the consistency of pot de crème but have the ingredients of a panna cotta. Panna cotta has no eggs in its mixture unlike pot de crème. Basically panna cotta gets its thickness due to the gelatin sheets or agar agar whereas pot de crème use eggs as thickening agent. So let’s say pot de crème are heavier and creamier therefore cannot be served upside down like panna cotta would thanks to the gelatin. Panna cotta is served with some sort of fruit coulis or flavored crème anglaise and pots de crème are served with whipped cream (as if there is not enough in the mixture!!). I see panna cotta the Italian version of the French pot de crème and I don’t think I have a preference, donc il n’y a pas de jaloux! (no one is jealous). Soak gelatin sheets or dissolve agar agar in water. In a pot, mix milk, cream and sugar, then add chopped chocolate if using chocolate bars or you can also use chocolate chips. Bring the mixture to a boil allowing the chocolate to melt slowly. Let it boil for a few minutes, at that point, the chocolate will be melted. Remove from heat and add gelatin sheets (or agar agar) and stir well to let the gelatin dissolve completely in the mixture. Add vanilla extract. Humidify small cups or ramequins. Pour the chocolate mixture, let it cool and refrigerate for at least 4 hours. This entry was posted by silvia on April 15, 2010 at 6:34 pm, and is filed under Desserts. Follow any responses to this post through RSS 2.0.You can leave a response or trackback from your own site. love love it. And I like the fact you used low fat milk…. i need something low fat once in awhile. this is deliceous,wow!and a beautiful presentation! Thank you for this informative post. I always seem to learn something from you. I was sneezing all last week. My damn nose was like a runny faucet. Anyway lovely presentation. My wife is a chocoholic and she would love this. 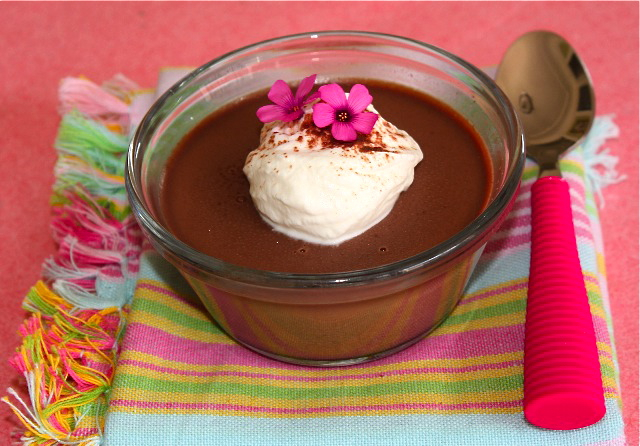 So pots de creme are on my list to try….panna cottas I’ve made before. The flowers add a dainty, colourful touch! Kristy, are you kidding? I see the monkey in it!!!! you are hilarious! 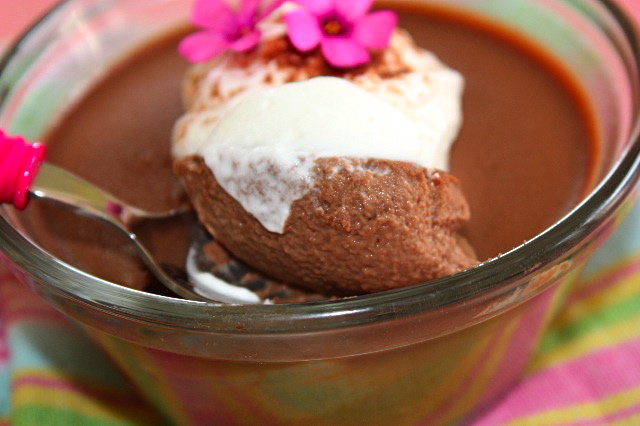 Mmmm….creamy, chocolatey and delicious. Looks Hawaiian with the 2 beautiful flowers! I have never worked with gelatin sheets, obviously I was missing something as this sounds like the perfect ingredient for panna cotta..I havent ever tried it before, you always give me the inspiration and incentive to do so, with these mouth watering recipes. Are you sure you can’t teach in Florida somewhere so I could be your student!!! I love the presentation how did you learn to make food look so beautiful? So pretty – if chocolate can be like spring, then this is it. Honestly my head is so stuffed from allergies too that I can barely smell anything, so I must settle for looking at, not tasting, good food! So sorry to hear about your allergy. I hope it passes soon so that you can taste all the spring flavors! Your chocolate looks so rich and delicious! That looks so pretty. Almost too pretty to eat,lol. You know what would be fun too? To have candied flowers on it as well! Looks yummy. I don’t care what you call it as long as you keep it chocolate! Panna cotta with low fat milk??!! I’m so there!! So decadent and chocolatey! I love your presentation with the flowers! Yummy… Recipe with chocolate is my favourite. Omg. What a delicious recipe. I can’t tell you how much I would diie to have that for dessert right now. After my breakfast. Mmmmm! It’s just 7:30am. And I already have this this picture engraved in my brain, it will follow me through my day. So pretty and creamy. OMG! What a sinful heavenly chocolate treat! what ever we call it, it certainly looks delicious!! I could use a cup of it now!! Beautiful, but is definitely a panna cotta because it is cream solidified with gelatin. Pots de créme are made with eggs and never use gelatin. You can make pots de creme with low fat milk as the amount as the key important ingredient in the pots de creme are the eggs (yolks)!! !